A cry for help please. I am looking for a pdf manual for the NEVADA MS-1000 User Manual. or scanned images would be appreciated. The problem is, there seems to be more than one model of AR1000. The homebase which bigyun seems to have & the only AR1000 on most lists, a handheld scanner. And the list you have of similar scanners are all handhelds, so the wrong scanners. The Nevada MS 1000 looks like this.. The AOR 1000 looks like this. The Nevada looks to be a rebadged AOR, but not a AR-1000. Sorry Tony I can't help with a manual but a couple of thoughts came to me,(1) Have you tried an email to Nevada in Portsmouth? (2) Have you had the top off and checked the pcbs for manufacturers codes which may lead to who actually made it. This was asked on another site I came across and the answer given was that the programming for this scanner is identical to the AOR AR2000. maylandmanta wrote: This was asked on another site I came across and the answer given was that the programming for this scanner is identical to the AOR AR2000. The AR 2000 is another handheld & almost identical to the AR1000. This answer seems to be getting repeated across a lot of platforms with no explanation as to why a handheld & a base radio which have different buttons are the same. 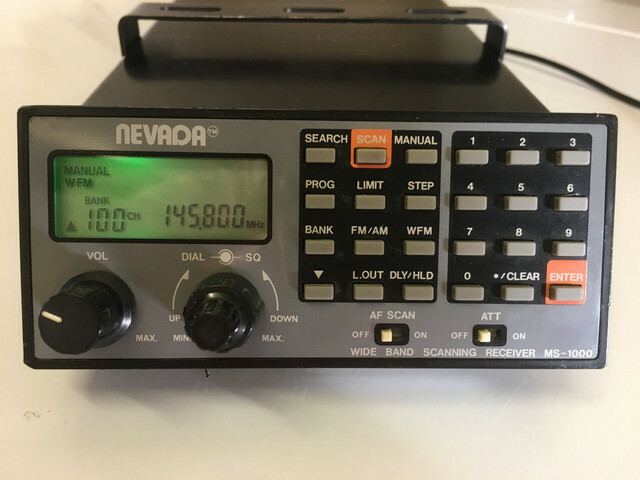 For example the AOR 2000 has a button marked Inc, the Nevada does not. Whilst the Nevada has an AF Scan switch & the AOR does not. And if simple things like buttons are different then almost certainly the way the radio needs to be driven is too. And yes I know operating a band scan or channel scan will probably be similar, but beyond that basic operation things will probably not be. So doing a factory reset or finding duplicate channels etc will not be helped by the wrong manual. I am with ilikeradios. Contact Nevada.